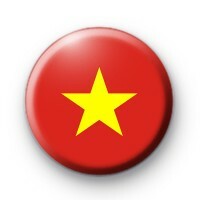 This is a 1 inch button badge with the National Flag of Vietnam. Which is bright red with a five pointed yellow star. Vietnam is a popular place to travel to and has some incredible coastline. Its capital is Hanoi and Vietnam is on the South China Sea. We have lots of world flags in the shop and they're popular with schools, sports clubs and with people that are patriotic.